← Treating Your Numbers in Type 2 Diabetes—Is Lower Better? When a child is potentially very sick, the doctor goes through a standard set of procedures as detailed in the Pediatric Advanced Life Support Course (PALS). There are three emergencies that can occur in an infant or child that need immediate treatment: respiratory problems, circulatory problems, and sudden cardiac problems/ sudden cardiac arrest (the last of these is very uncommon in children). The vast majority of non-traumatic emergencies in pediatrics involve respiratory problems (respiratory distress or respiratory failure) or circulatory problems (shock). 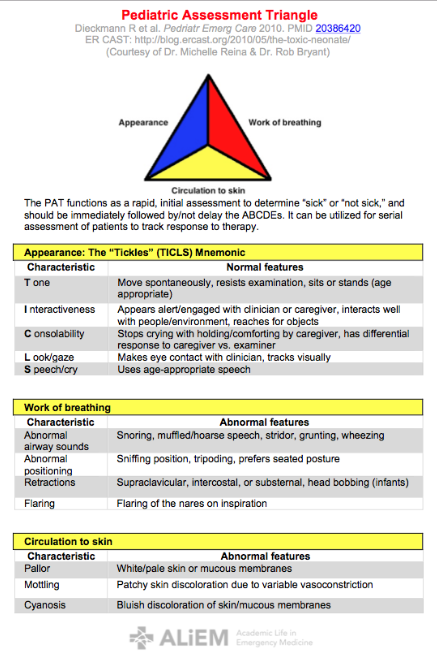 The PALS course algorithm details four steps in the emergency evaluation of an infant or child. These are: the general assessment (the pediatric assessment triangle), the primary assessment, the secondary assessment, and the tertiary assessment. The first step in the general assessment (the pediatric assessment triangle). In this step the doctor simply looks at the patient and listens to the patient. It only takes a few seconds. The doctor is assessing the patient’s appearance, work of breathing, and circulation. The doctor notes the child’s appearance meaning the child muscle tone (active, moving around vigorously or barely moving), the child’s alertness (looking around, aware of what’s going on, or listless, out of it), the child’s speech or cry (strong and clear or weak or garbled). The second step is to evaluate the work of breathing. The doctor looks and listens to see if the child is having trouble breathing, working hard to breath (nose flaring, neck or chest sucking in when child breaths), breathing too fast or too slow, making abnormal breath sounds (wheezing or grunting or inspiratory stridor). The third step in the general assessment (the pediatric assessment triangle) is to look at the child circulation status. The doctor looks for abnormal skin color (palor or mottling or bluish/gray skin) which suggests that the child has poor perfusion (shock) or is not getting enough oxygen. The child might have both problems. If the child is flushed he may have fever. Sweating in a child could mean fever or a cardiac problem (shock). After completing, in a few seconds, the pediatric triangle (appearance, work of breathing, circulation), the doctor decides whether the child has a life-threatening problem or not. If the doctor decides that the child has a life-threatening problem, she immediately actives the emergency response system (to get more help and more equipment) and begins immediate treatment. The immediate treatment often includes giving oxygen, assuring that the airway is open, providing respiratory support (helping the child breath with bag-mask ventilation), monitoring the patient (putting the patient on an cardiac and respiratory monitor), attaching an oximeter (to measure oxygen saturation), and placing intravenous line so that fluids and medicine can be given if needed. Remember that this general assessment only takes a few seconds to look at the child appearance, work of breathing, and circulation. If the general assessment (pediatric assessment triangle) shows that the condition is not life threatening then the doctor proceeds to the Primary Assessment. Tomorrow, I’ll go over the primary assessment.